Phillips, Commander Rex (1931-2015 ). Oil on canvas, signed Rex Phillips and dated '85. The artist has written in pencil on the canvas stretcher: "South Atlantic Dawn. Type 22 frigate screening HMS HERMES - Falklands War 1982". A skilkfully executed oil painting which has captured the atmosphere exactly: Rex Phillips has also painted the Type 22 frigate with all her quirky shapes and angles and domes superbly. 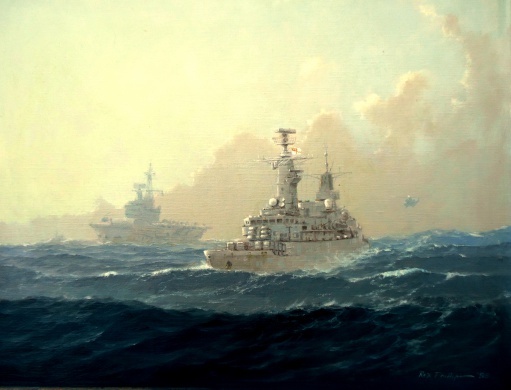 This is a fine and accurate picture of the Royal Navy's daily, routine activities in the South Atlantic during that war of 1982 and the many years spent patrolling down there by countless HM Ships and RFAs for some two decades afterwards: indeed there is still a guardship or two on station in the South Atlantic to this day.